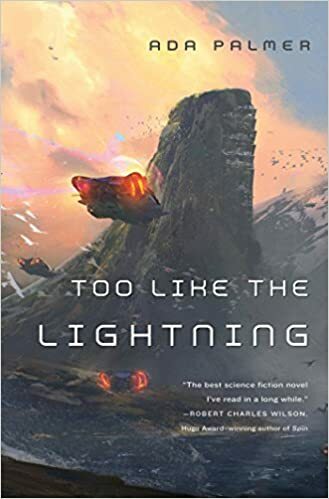 Had Too Like the Lightning lived up to its aspirations, it would have been one of the most significant works of contemporary science fiction. That, perhaps inevitably, it fails in this ambition leaves a book that is engaging, entertaining, and interesting, but that contains too many confusions and contradictions to be fully satisfying. The aspiration, made explicit within a text which makes constant reference to Voltaire, Diderot, Rousseau, and De Sade, is to imagine a world shaped and ruled by the ideals of the French Enlightenment. The Enlightenment can, perhaps, trace its origins back to that chilly morning at the end of January 1649, when the crowds on Whitehall witnessed the execution of the English king. It was an act that sent shockwaves throughout Europe, and prompted a radical reexamination of the relationship between governed and government. Political philosophers, such as Thomas Hobbes and John Locke, began to think of government as emerging from the needs and wants of the people rather than being imposed upon them. As these ideas spread and developed, it led to the emergence of the Enlightenment, an inherently democratic movement that embraced Tom Paine’s Rights of Man, and Mary Wollstonecraft’s Rights of Women. The ramifications of these beliefs were more than just political: if men and women were to have rights, then they needed to be educated (as Rousseau advocated) and informed (hence Diderot’s Encyclopedia); they should be free of the shackles if not of religion then at least of the Church (prompting Voltaire’s anti-clericalism); and there should even be sexual liberty (as De Sade, if few others, proposed). This, then, is the philosophical foundation upon which Too Like the Lightning is constructed. Or, at least, so the novel repeatedly tells us. Its twenty-fifth-century world has gone through cataclysms in the past, which are vaguely hinted at but never clearly defined, out of which a handful of great men imposed their will upon the world. The result of their forcefully applied benevolence is a new Enlightenment that echoes the eighteenth-century French original, even down to the costumes that world leaders wear in the privacy of their Paris bordello. We are presented, therefore, with a world in which there are supposedly no gender differences: even gendered language has been outlawed, so that everyone is referred to as “they” and “them” rather than “he” and “she.” This could have been an interesting literary device on a par with the non-gendered language in Ann Leckie’s Ancillary Justice (2013), except that the narrator has barely begun before he (yes, it’s a he) finds an excuse to refer to characters as he or she. By the end of the novel, the gender of every significant character has been unmistakably signalled. Nor does this equality appear to extend to jobs, since virtually every figure of power and authority is male, while the more prominent females tend to take on the roles of wife or lover or, of course, in one case the Madam of the brothel that seems to be the secret centre of world government. And, yes, there is the invitation-only brothel where the particular tastes of the world leaders are catered for, which tends to suggest that De Sade’s sexual liberty is here reproduced as libertinage. Voltaire’s anti-clerical beliefs are now fixed in stone. Religion is outlawed, and the spiritual needs of the population are catered for by “sensayers,” who talk over any moral problem in a way that is ponderously even-handed, and which very carefully avoids all reference to God. Not that the casting out of all religious observance necessarily makes this a secular society. One character, we eventually discover, is actually worshipped as a God by those close to him, while the most prominent sensayer in the novel, Carlyle Foster (a significant name, and we will come back to its implications shortly), is himself prone to all manner of inchoate religious impulses. In fact, for an anti-religious Enlightenment, religion plays an alarmingly central role in this novel. Diderot’s Encyclopedia is here, naturally, repackaged as a sort of internet to which everybody has instant and complete access through a device they wear at all times known as a “tracker” —which probably gives you a clue as to how this Enlightenment access to information has been subverted. Yes, the tracker allows you to summon at a moment’s notice a car that is part of a global transport network and that can get you, at no cost, to any part of the world in no more than an hour or two. To that extent, the tracker equates with freedom of movement, but it also allows you to be tracked; at every hour of the day or night your whereabouts can be detected. This is not, despite appearances, a free society. I apologise for taking so long to lay out the background to the novel, but the worldbuilding is complex and extensive; although cleverly worked, there is more infodump than plot in the novel, and the plot is absolutely dependent upon the structure of the world. The real, deep political structure of this mid-twenty-fifth century owes little if anything to the Enlightenment. On the macroscopic level, this is a world without nations (except for Spain)—although nationalities, or at least national rivalries, still seem to be a thing. Instead, one of the founding fathers of this world established supranational bodies which people join according to shared interests rather than place of birth. That there are only seven such Hives seems to me to smack more of authorial convenience than the likely divergence of human interests and affiliations, but that is by-the-by. On the personal level, this same impulse has done away with the family, replacing it with the bash’ (derived from the Japanese, “basho,” just as sensayer is seemingly derived from the Japanese “sensei”; Japan was not noticeably a part of the Enlightenment): a homestead in which people are drawn together by mutual interest rather than family ties (although the bash’ with which we are made most familiar does indeed seem to be based on family relationships). This reimagining of personal and political loyalties is the most interesting thing about the novel. As with so much else, however, Palmer undermines the idea as soon as she starts to describe it in practice. This is, I am sure, in large part intentional—because the historical person who is referenced at least as much as any of the leading lights of the French Enlightenment is Thomas Carlyle, and Carlyle was an anti-Enlightenment writer if ever there was one. The Enlightenment had led, with a strange inevitability, first to the American Revolution and then, more terribly, to the French Revolution. Both proved as shocking as that original beheading of Charles I, and prompted a reaction against Enlightenment ideas. Carlyle, an essayist whose work was common fodder of English schools at least until the First World War, though he has been somewhat forgotten since then, was the harbinger of a new Puritanism that took hold in Victorian Britain. More significantly, he propounded the Great Man theory of history, the idea that all of history is the story of a few great men, and these would serve as what he called “pattern men,” models of behaviour for the self-help ethos of the age. Carlyle’s view of the world, therefore, is both selfish and hierarchical, and, for all its protestations of an Enlightenment model, in detail the world of Too Like the Lightning is closer to what Carlyle might have imagined. This is a Great Man fiction. It was the actions of two or three great men who brought order from chaos, and initiated the settled and enlightened state of the world we see in the novel (though when their world-changing speeches are repeated during an anniversary reenactment partway through the book, they are strangely uninspiring). The seven Hives that now divide the world are each the domain of one all-powerful ruler (again following Carlyle’s ideas—this is not a world of representative or democratic government), and all but one of them is a man; the exception is the caring Hive, the Cousins, who provide the world’s sensayers (and so even here the woman is in a nurturing role). These modern masters of the world have each taken on the manners, costumes, and, particularly, the titles of eighteenth-century French aristocracy. It is this hierarchy that is one of the plot-drivers of the novel. Each year, lists are published which rank these seven world leaders. The rankings seem to be entirely subjective, or at least no objective criteria are even hinted at during the novel, and yet the relative rise and fall of anyone’s standing can apparently have a profound effect not just on their Hive but on the political and economic stability of the entire world. This year, however, one of these lists has been stolen on the eve of publication, and, moreover, a crude attempt has been made to pin the blame for the theft on the bash’ that controls the global transport network. Even more unsettling, this new list apparently presents a radical shift in rankings, which could do untold damage to the world order. The various rulers put aside their rivalries and private passions to deal with the emergency. They need to find out who, how, why, and, above all, how to stem the damage. The various investigations devolve, by happenstance as much as anything else, upon two men. One, J.E.D.D. Mason, is the adopted son of the most powerful of the rulers, an austere, puritanical figure with a mysterious power that has caused some of his followers to worship him as a god. The other is our narrator, Mycroft Canner (names in this novel are overly loaded with significance), who is the most curious of the Great Men who populate this story. Mycroft is many things, most of which would still look odd if ascribed to two contrasting figures, and when combined in this one character they make practically no sense at all. He is, first and foremost, a mass murderer: he killed practically all of the inhabitants of one particular bash’, devising exquisite and outlandish tortures for each one in turn. This was, we are told more than once, the worst crime in centuries, and it is one for which Mycroft offers no explanation, no exculpation. Yet we are invited to regard him as the unequivocal hero of this story. In this world, only the very worst of criminals are incarcerated; most are given a blue uniform and the name Servicers, and sent out to do public works. We might more readily recognise them as slaves. Such is the severity of Mycroft’s crime that he might realistically have anticipated imprisonment, but strings were pulled by the most powerful in the land and he was made a Servicer. That his crimes still resonate with the populace is shown when a crowd learns his identity and attacks him; in this novel, the only way we ever see ordinary people is as a mob. But it is not just that Mycroft has been given a relatively easy sentence; in fact, he has a remarkable amount of freedom. He mixes, unsupervised, with the most powerful people in the world, and is on fairly friendly terms with most of them. They grant him access to their private meetings, call upon him for all manner of highly technical jobs, and welcome him to their most glittering functions. Indeed, he seems to be some sort of genius with amazing insights into the most abstruse aspects of world government. The world, in short, could not function without Mycroft. All of this is less the creation of a complex character than an agglomeration of contradictions, but there is still more: Mycroft is a white knight, who has taken it upon himself to protect Bridger, a young boy who appears to be completely off the net. (I find it strange that Palmer makes no effort to tell us how unusual this must be in the excessively interconnected world she has created; perhaps she thought that Bridger was already strange enough.) Bridger has the ability to make inanimate objects (mostly toy soldiers) come to life. Mycroft recognises that this is a miracle, something that is going to change the world out of all recognition, and has vowed to protect the boy by keeping him away from the prying eyes of precisely those powerful people who are his associates and employers, those people whose power he is currently working all-out and wholeheartedly to defend. There are mysteries galore here: who is Mycroft, why did he commit his crimes, and how has he attained the position he now occupies; what is Bridger, and by the same token what is J.E.D.D. Mason; and even the most basic mystery, concerning the crime that sets the plot in motion and its ramifications for the entire system. It is fair to say that none of these mysteries are resolved in this novel. But then, Too Like the Lightning is far more about worldbuilding than it is about plot, so we will have to wait for a second volume to find out what, if any, the solutions might be (and, indeed, whether this new Enlightenment will lead in its turn to a new Terror, which I somehow doubt). As for the worldbuilding: the Enlightenment system is undermined too consistently for this to be anything other than intentional. And yet the alternating praise of Enlightenment and the questioning of it, the lauding of Voltaire and advocating for Carlyle, is never quite clear enough to make it seem anything other than a series of contradictions and confusions. Picking through all of this is a fascinating intellectual exercise, and there is more than enough here to hold the interest of the reader; yet it is too unsure of its own structures and intents to be fully satisfying. Paul Kincaid has received the Thomas Clareson Award and the BSFA Non-Fiction Award. He is the author of What It Is We Do When We Read Science Fiction and Call and Response . His book on Iain M. Banks will be published by Illinois University Press in 2017. The reviewer correctly acknowledges that Palmer undermines and contradicts the Enlightenment system intentionally (which she clearly does), and yet closes his review with "yet it is too unsure of its own structures and intents to be fully satisfying"! If this were a stand-alone novel, that critique might be valid, but as the first of an anticipated four volumes, I think Palmer makes absolutely clear she is fully in command and cognoscent of the inconsistencies, contradictions and paradoxes she has created and the resolution/conclusion the reviewer seeks will be forthcoming in future volumes. My sense is that Palmer is neither advocating nor condemning Enlightenment philosophy, but rather is telling a story about a future Enlightenment that (like the one a thousand years before it) moves culture forward through the disruption it causes, that being fertile ground for the manifestation of human spirit. I agree with Phil here - what you're describing as contradictions, I see as tension, which is very much at the heart of the story. I disagree with other observations in this review as well. For example, yes, the narration assigns a gender to each character, but also constantly plays with this as a device -- making clear that some of the characters' biological gender is opposite from what he's using. The narration is *not* using the gender-less "they/them," but it's playing with gender in a different way, that constantly draws attention to itself and provokes thought. Or, I don't think Mycroft or the world leaders *are* meant to be seen as Great Men. They're exceptional, to be sure, but each of them is also the product of their society, funneled towards the same circles and boundaries. If there are Great Men, people who really *are* going to make a difference, those are clearly signaled as being Bridger and J.E.D.D. Mason - who are supernatural catalysts of change, and hardly really human at all. I agree with the above two commenters, especially Phil's comment about this not being a stand-alone novel. Having just started the second of the four books, "Seven Surrenders", which was just released in March 2017, I think it's fair to say that the two books really form halves of a larger novel. From the outset, "Seven Surrenders" dives into answering many of the lingering questions and dangling points that we were left with at the end of "Too Like the Lightning": we learn more about Mycroft's crimes and their justifications for them, we learn (in case it wasn't clear already) that Mycroft is a decidedly unreliable narrator, and the impact of the shocking revelations at the end of the first volume comes very much to the forefront. Something I think also deserves mention as a framing piece for these two novels, and indeed for understanding the course of human history in general, is Palmer's piece "On Progress and Historical Change" located at her blog, Ex Urbe (http://www.exurbe.com/?p=4041). It's the longread that I've been mulling over most frequently given recent world events, and it speaks directly to Palmer's fiction (and vice-versa). I loved this review and found it perfectly on-point. And I have to say that early in the book, on page 96 I think, the description of the Blacklaw character throwing back "their" head and laughing their evil Simon Legree laugh was so corny as to be worth of a Rocky and Bullwinkle episode. In my mind it will join the hallowed, "It was a dark and stormy night..." as literary kitsch. I stopped reading the book at that point. With so many intriguing and really complex ideas to express, I think it would have been better for the author to stick with generating those and to have let someone else actually write the book.